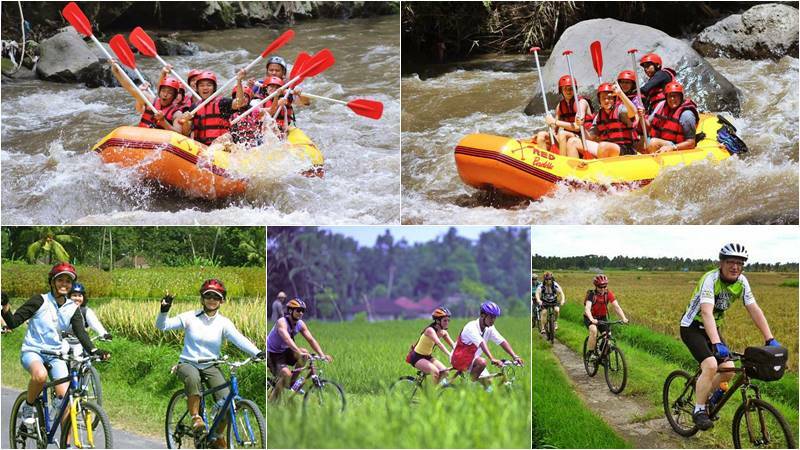 Bali Rafting + rice paddy & village cycling is an interesting Bali Rafting Tour Package, a combination of Ayung river rafting and cycling adventure in Bali. We will take you to the rice paddy and town cycling before your rafting, where you can see how beautiful the island is with the farming, and how you meet the local people. This could be the most unforgettable combination adventure. 08.00 : Guests pick up from their hotel and transferred to Ceking village where rice field and village cycling will be started. 14.30 : Finish lunch you will be transferred back to your hotel. Explore Bali’s tranquil countryside on the back roads and discover Balinese rural life with us. This cycling tour is designed for tourists who want to explore the landscape of Bali and to witness the daily life of rural rice farms and villages. You are always welcome with the smile and friendliness of the villagers and the charming children in this Bali cycling adventure. The experiences of seeing the beauty mountain or the lovely village of Bali, which have a lot of fascinating heart. The journey will end at our rafting departure point and then prepare for the rafting equipment, and take a raft at the Ayung River. Join our Bali Ayung River Rafting professional team for fantastic Bali rafting experiences, enjoy a unique and unforgettable tour through winding gorges, the lush jungle and the magnificent terraced rice field. The water volume is stable throughout the year with few speeds of water, allowing you to have great fun rafting. For safety, all participants will be fitted with life jackets and helmets from our beginning at the start point. Our experienced guides will lead you through your thrilling Ayung rafting adventure for around 2 hours. Follow his instructions and paddle along the way, laughing, shouting and experience a tremendous adventure. This is the best way of feeling the wonder of the Ayung River. Shower, towel and changes will provide at the finish points followed by Indonesian Buffet lunch services. Ticket for cycling with rice paddy, village and local life view.